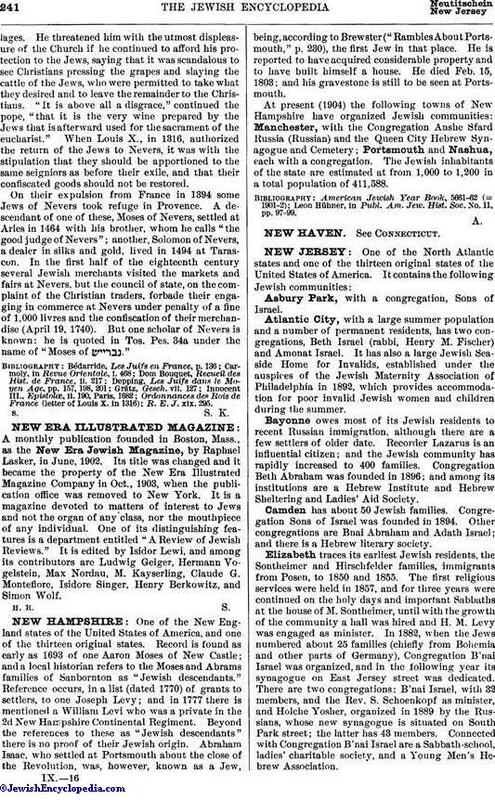 A monthly publication founded in Boston, Mass., as the New Era Jewish Magazine, by Raphael Lasker, in June, 1902. Its title was changed and it became the property of the New Era Illustrated Magazine Company in Oct., 1903, when the publication office was removed to New York. It is a magazine devoted to matters of interest to Jews and not the organ of any class, nor the mouthpiece of any individual. One of its distinguishing features is a department entitled "A Review of Jewish Reviews." It is edited by Isidor Lewi, and among its contributors are Ludwig Geiger, Hermann Vogelstein, Max Nordau, M. Kayserling, Claude G. Montefiore, Isidore Singer, Henry Berkowitz, and Simon Wolf.